I set out to create some vegan breakfast sausages and failed miserably but what I did create was a savory breakfast cake that the baby toddler loved! He still only has 4 teeth but an ever-growing appetite so I am always looking for good food he can gum down. Combine all wet ingredients with spices. Add in the wheat gluten and nutritional yeast and stir until fully combined. You may find it easier to knead with your hands after awhile. 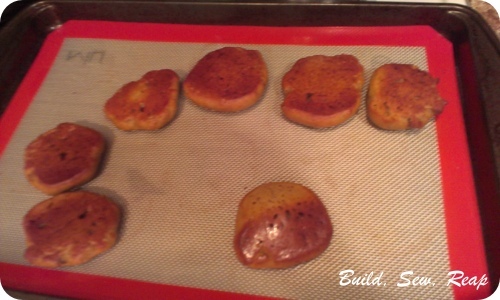 Form into patties and place on a greased pan or nonstick mat. Cook for 10 minutes then flip and cook for another 10 minutes. Allow to cool a bit before handing over to your baby. These are easy to chew and tasty. I encourage you to adjust the flavoring to suit your child's likes. they really were quite tasty and the little guy inhaled them.